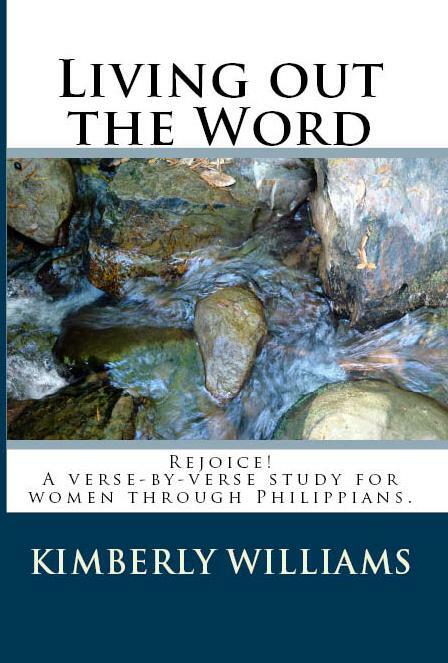 It is because of this that I have written two expository Bible studies for Women called Living Out the Word. One is through the book of James called Faith. And the other is through the book of Philippians called Rejoice. I am currently working on a book through the Epistles of John called Love. I am going to give away one of my Philippians books in two weeks to one of my readers. Mandatory to Enter: Leave a comment with your favorite verse from Philippians. Additional entries: TOS Crew members, Subcribe to this blog (rss or email), spread the word about this giveaway (blog, facebook, etc) and leave link in comments. I will choose a winner (US Residents only) and mail it out on Friday, July 3oth. You can take a look inside the book here at amazon.com. One of my favorite verses in Philippians is 4:13 – I can do all things through Christ who strengthens me. I also like 2:5-8 where it reminds us that Christ, who was God, became like us – men – and died because of His obedience to Christ. That truly shows us how to be obedient. I am a TOS Crew mate too! The book of Philippians is one of my favorite books of the Bible. I agree with you about your Bible study method – verse by verse. I am also a TOS Crew member. It is nice to meet you. Fav Phil verse is 4:13 I can do all things Christ who strengthens me. My favorite verse from Phillipians would have to be 4:13. I can do all things through Christ who strengthens me. This was pretty much out youth groups verse when I was younger and has stuck with me. Nice to know we can trust Him tol meet all of our needs! I don’t have a copy of this study! Please enter me. My favorite verse in Philippians right now is 4:8 – Finally, brethren, whatsoever things are true, whatsoever things are honest, whatsoever things are just, whatsoever things are pure, whatsoever things are lovely, whatsoever things are of good report; if there be any virtue, and if there be any praise, think on these things. I also emailed a notice of it to lots of friends! Just found you through the TOS Crew and would love to win! I LOVE Philippians, so I’ve got lots of favorite verses from there, but my current fav is 1:6: “Being confident of this very thing, that He which hath begun a good work in you will perform it until the day of Jesus Christ.” I’d love a copy of your book!! Just stopping by from the Homeschool Crew. We are on the same Mini Crew! I look forward to looking through your blog more. On TOS Crew – YEA! I am leaving a comment… I really need accountability to get in the WORD daily -help! This is such a wonderful book! I just looked through on Amazon and I am really enjoying reading:) Congratulations on your book. My favorite verse…I actually lost my Bible and am using my husband’s. It is throwing me because he has the New Living Translation-a different translation–and I miss mine! Anyway, One of my favorite verses is Phil 4:4-5, “Always be full of joy in the Lord. I say it again, — rejoice! Let everyone see that you are considerate in all you do. Remember, the Lord is coming soon.” I’m off to post this on Facebook. I will try to blog about it soon. (when I get done, I’ll leave more comments) I am so pleased to be on the crew w/you! I’m on the crew with you and found this from a post by your FM on facebook. Let this mind be in you which was also in Christ Jesus…love it!! Thanks for such a GREAT giveAway!